China's deputy health minister Professor Huang Jiefu was wearing his surgeon's hat when performed a liver transplant in Guangzhou this week - but some cynics have questioned his qualification to do so. The 66-year old deputy minister like to keep his hand in as a transplant tsurgein and is never far away from the operating table, performing an average of two operations a week at the Beijing Union Medical College Hospital . 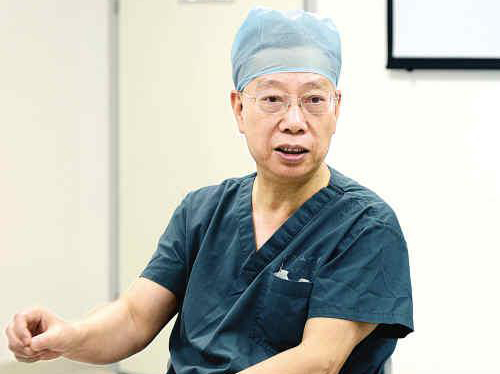 Professor Huang paid tribute to the deceased woman and her family for donating the organs saying: "this death saved three lives and in addition also allows two people to see with corneal transplants, which is a great thing." Professor Huang has the vision that China can build a sustainable ethical and national organ donation transplant system. He lead the way in setting up the Chinese Human Organ Transplant Ordinance promulgated in May 2007, and has been open in admitting to the international community to the fact that China had been using organs from executed prisoners as a major source of transplants - but now wants to change that. "Since the donor organ pilot, organ transplant regulations have achieved significant progress in Guangdong and voluntary organ donations next year may exceed the number of death row inmates organ. Of course, we do not opposed to the death row inmates voluntary contributions. " However, after the publicity over the latest transplant procedures by the minister some Chinese citizens took to microblogging sites such as Weibo to question whether he was fully licensed and qualified to do so, and questioning how he could be both a senior government minister and "moonlighting" as a practicing clinician. Professor Huang responded with good humour to allegations that he was an "illegal doctor". "I have been licensed as a doctor since I graduated from medical school, I wrote China's national textbook on liver transplants, I do liver transplant teaching videos, and I am also been recognised by medical organisations in Australia and in the United States. Being a practising surgeon is the most important thing in the world to me - how could I not have a medical license in this country? " In response to the accusations of "moonlighting" argument, Professor Huang responded that although he is a Ministry of Health official, his most fundamental role is still as a doctor, "The media calls me Minister Huang, but I actually prefer the title of Professor Huang. The priority in my life and career has always been to help and treat the patient, and I have always had career satisfaction and pride through the surgery I do with my hands, seeing patients to restore health." I also doubt his qualifications though i don't know much about him, the thing is how can a health care facility allow someone to perform such kind of surgery no matter if the person is a minister and how qualified he is.